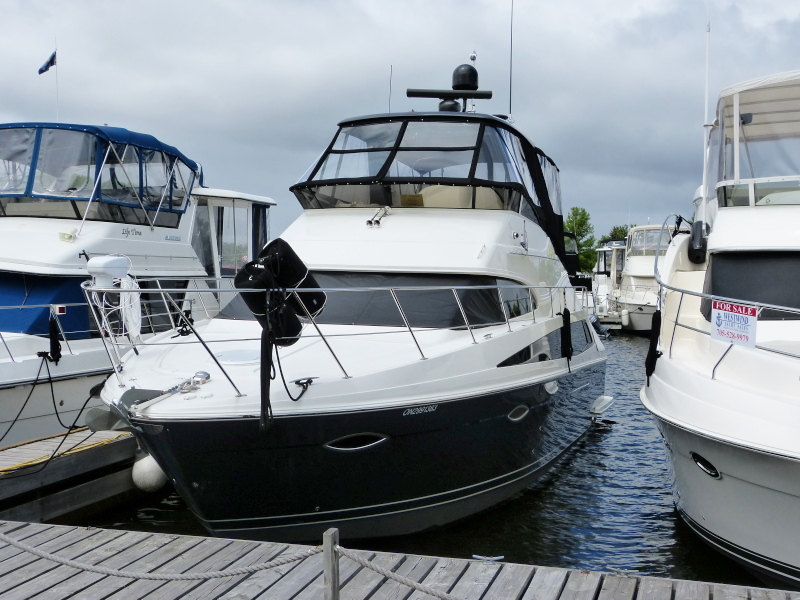 The Carver 43 Super Sport is a true live-aboard cruiser with a cavernous interior made possible by raising the sidewalks to near flybridge level. The extended bridge provides great topside entertainment space complete with a fully equipped wet bar and a large wraparound passenger lounge. Sidewalks leading to the fore deck are accessed from either side of the cockpit via molded steps. The self-draining cockpit is hardtop covered with transom door access to a large swim platform, and sliding door access to the main salon. The additional hydraulic platform extension provides a superb dinghy management system. Below decks, the main salon is configured for nonstop entertainment or quiet relaxation. Décor includes high shine cherry wood accents, countertops with wood inlay and cherry wood sea rail, a Natuzzi Ultrasuede chair and ottoman, a retractable sleeper sofa and built in entertainment centre that includes a marine grade LCD flat screen with Raytheon satellite feed. The galley is outfitted with dark, solid surface countertops and burled cherry flooring. Recessed halogen lighting coupled with a convection microwave, 2-burner smooth top stove and Nova Cool upright fridge/freezer, make snack and meal preparation a breeze. A dinette with an L-shaped lounge opposite the galley provides a comfortable eating area .There is a hatch accessible laundry/storage room accessed by stairs beneath the galley. Not to be overlooked by any means is the Volvo IPS propulsion system. This is a modern pod-drive system with counter rotating forward-facing propellers (4) that offers significant benefit over straight shaft inboards. Known best for intuitive joystick control for docking and close quarters maneuvering, IPS also provides major fuel savings at cruising speeds, increased range, reduced CO2 emissions, reduced noise and vibration, and higher top-end speeds. And these aren’t minor improvements. Volvo states IPS provides performance improvements of 30-50%* in several areas over similar planing hulls equipped with traditional shaft drives. This 43 Super Sport has the standard joystick at the helm and a second control in the starboard cockpit. Call to book an appointment to view this one-owner, low hour, freshwater vessel. You will not be disappointed.